"Then King Felagund spoke before his people, recalling the deeds of Barahir, and his vow; and he declared that it was laid on him to aid the son of Barahir in his need, and he sought the aid of his chieftains. Then Celegorm arose amid the throng, and drawing his sword, he cried ‘Be he friend or foe, whether demon of Morgoth, of Elf, or child of Men, or any other living thing in Arda, neither law, nor love, nor league of hell, nor might of the Valar, nor any power of wizardry, shall defend him from the pursuing hate of Fëanor’s sons, if he take or find a Silmaril and keep it. For the Silmarils we alone claim, until the world ends.’"
Love the colors and the framing! On consideration, I think if I were painting it again I'd use fewer colours. That red cloak, in particular, seems a little too bright. I am too much of a magpie with bright colours, I have to keep telling myself that less can be more! 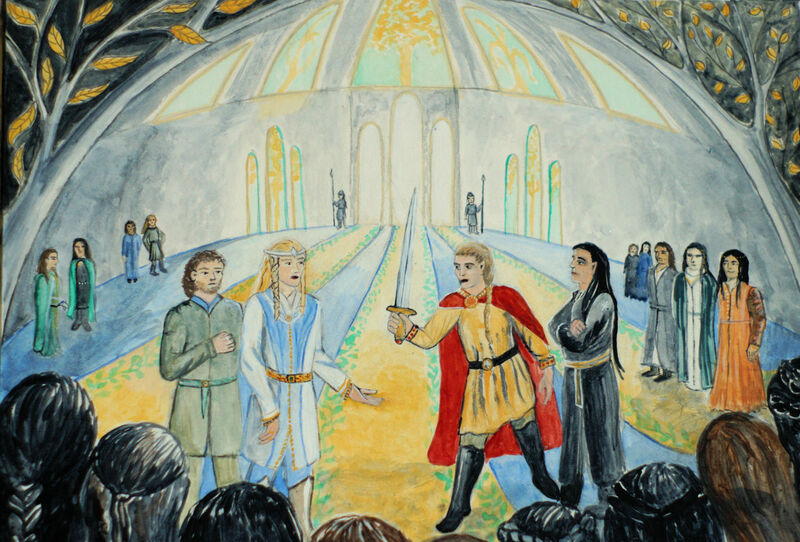 I liked your retrospective analysis of this scene by Finrod and Maglor in your Valinorean series. It didn't seem quite like a 'wisest of the Noldor' moment, somehow! Interesting framing - it almost feels like the fish-eye effect one gets from looking at something through a crystal ball or a drop of water. I do find architecture hard to draw - much harder than landscape. This is supposed to be inside a cave though - a big cave - so I tried hard for something that would give it a slightly more posed look.